Olympus posted full year and last quarter results.. Financial report of Olympus says the company is facing loss in overall operating profit, but the good news is Mirrorless sales are up +5% compared to previous finical year. In the mirrorless interchangeable-lens camera field, the OM-D series and “OLYMPUS PEN-F,” etc. increased sales, with sales also boosted by a contribution from the high performance interchangeable lenses “M.ZUIKO DIGITAL PRO” series with additions of new models bringing the lineup to five models. 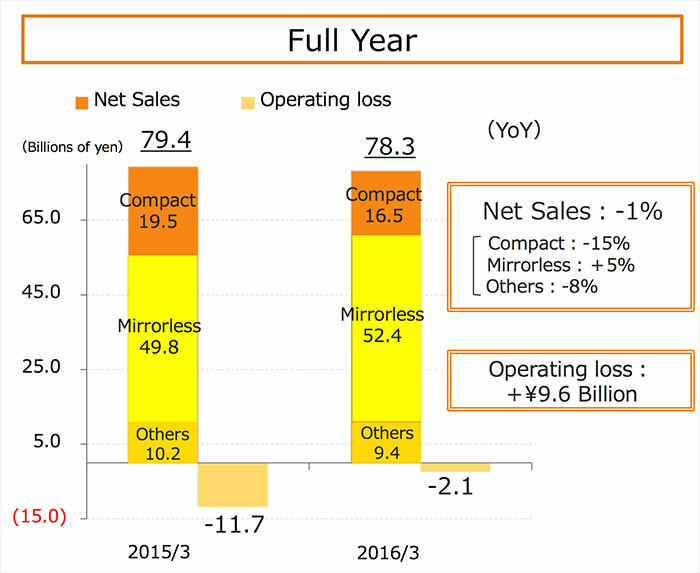 Meanwhile, in the compact camera field, the Company continued to limit the number of units sold in response to market shrinkage. Consequently, sales in the Imaging Systems Business overall decreased year on year. Olympus is also preparing to announce fullframe mirrorless cameras in future that will compete with Sony A7 series and will sure boost its market share. How can a small money losing operation afford a new FF product launch? But Olympus manufactures are not at all supporting their old olympus camera owners.